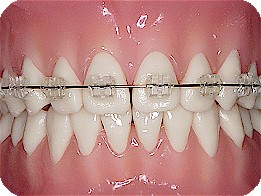 All of the braces used by Dr. Golden are state-of-the-art. By combining modern, highly-efficient technologies with a completely computerized office, patients enjoy shorter appointments, more time between visits, and less time in treatment. Your time is valuable - we recognize that. These technological advances have also made the braces smaller and more comfortable than in years past. Metallic braces are the most familiar type. The brackets themselves are manufactured in either silver or gold alloys. They are most often recommended for certain types of treatment. They are held on to teeth with space-age adhesive, so that frequent bracket breakage is less likely. 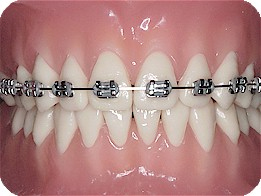 Here are pictures of these braces. Ceramic or "tooth-colored" brackets bond onto the outside surfaces of your teeth, similar to conventional (metallic) braces. Their clear or natural color gives them a less noticeable, "camouflaged" look and are often preferred to optimize esthetics during treatment. We have models of every type of braces in our office, and we look forward to discussing the different options with you at your initial visit! To help you determine which braces will be most beneficial for you, we will show you all of the possibilities at your first visit with us. 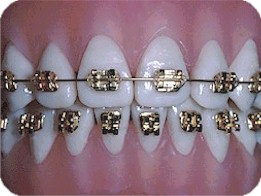 You can even choose to have clear braces on the top teeth and metallic (silver or gold) braces on the bottom.